Nantes is located in the west of France. With almost 300 00 inhabitants, Nantes is one of the most attractive towns in France. With more than 600 000 inhabitants, the town agglomeration (http://en.nantes.fr/home.html) is the 3rd largest industrial city and 2nd most successful city in terms of employment growth. You’ll find everything to prepare your journey by train in this site. If you want to play EVS after a road trip, you’re welcome too ! The highways connect Nantes with Rennes, Angers, Le Mans, Tours, Bordeaux, Orléans and Paris as shown here : http://www.autoroutes.fr/en/Realtime-traffic-information.htm. Once in the airport or at the railway station, where to go ? How ? No stress, we’ve got the answers and you too after rading what follows. Don’t ask for a taxi, there’s a shuttle ! The transports company in Nantes is called TAN (Nantes Agglomeration Transport, https://www.tan.fr/welcome-to-nantes-35406.kjsp). So you’ll see TAN or SEMITAN. Bus, tram, navibus, chronobus, busway : what the hell ? bus : as everywhere in the world, a bus ! what else ? You’ll find several lines all across Nantes and its agglomeration. The buslines number are over 10. From monday to friday, you’ll find a bus about every 10mn. You have to make a sign to the bus driver for a stop at the station. Onc in the bus, you have to press the stop button to ask for the next stop. tramway or tram : There are 3 tram lines (number 1, 2 and 3). You don’t have to ask for a stop : the trams. You’ll find a tram every 3-5 minutes, except on sundays where you’ll have to wait 5-10mn. The trams have their own place to go. You’ve got to stop with your car for the tram. busway : bus + tramway = busway ! It’s a bus which runs likes a tram (own place on the road and cars have to stop for the busway). There’s only one line : number 4.
navibus : you got 2 boats to pass over the Loire or the Erdre. Validate your ticket while boarding the 1st time. Show it to the bus driver during transfers (not in tram or busway). Children under 6 travel free accompanied by an adult. You can buy at self-service ticket machines, in the bus (not in tram or busway), with mobile app…. You can download TAN app for Android (https://play.google.com/store/apps/details?id=com.semitan.tan) or for IOS (https://itunes.apple.com/fr/app/tan/id502653639?mt=8). You can use an app based on opendata NaonedBus, but available only in french : https://play.google.com/store/apps/details?id=net.naonedbus. 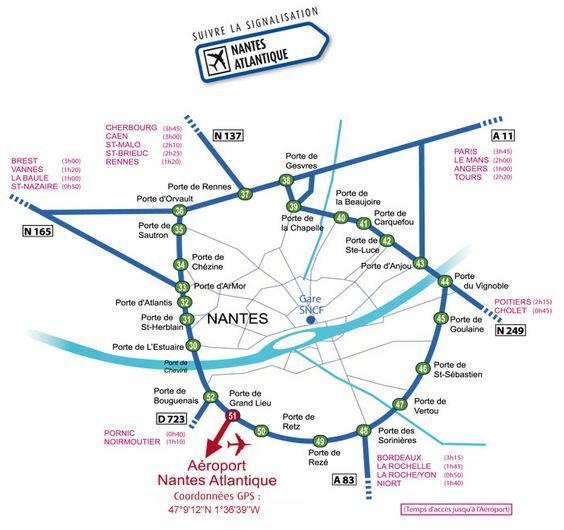 Looking for a map of Nantes ? Any question about history ? About point of interest ?